Unlike the first five books in which the hunt felt like a fast-paced game to beat the competition in finding the 39 clues, Book 6 focuses on family and ends in a more serious tone. Things turn deadly, and fourteen year-old Amy begins to have flashbacks of the night her parents were killed in a house fire. Just like its title, this one pulls you in deep as we get closer to the finish line. Amy and her eleven year-old brother Dan Cahill are in Australia this time, following their parents’ footsteps. They search and find their father’s cousin, Uncle Shep, who Dan and Amy knew as children. He’s a very likeable “surfing bum” whose aid becomes indispensable. Nellie Gomez, their au pair, is with them, of course, but more questions pop up as to who she really is, as once again she displays professional skills she must have been trained for. Not much fazes her. She can handle anything. The sights and sounds of Australia colour this book with descriptions of shimmering blue oceans, open skies, red earth, and the quirky Australian speech. As with all The 39 Clues books, a historical figure is responsible in some way to lead them to a clue and in this case it’s Amelia Earhart. As usual, the relationship between Amy and Dan is typical of a brother and sister, but it is tested anew when Amy keeps information about their parents’ demise from her brother. The only part that made me uncomfortable was when contemplating what happened the night Amy and Dan’s parents died. It brought up the heavy question of how far someone would go to gain power. 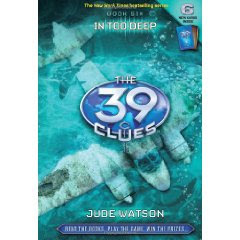 What could possibly be so important about the 39 clues that people would kill or sacrifice everything, including their lives? I’m thinking that Book 10 will have to come up with an amazing revelation or it will definitely be anti-climactic. Great review. Would really like to start reading these series.